It’s December, almost Christmas, and we’re already planning the upcoming dinners with friends, colleagues and families. And for those of you who have kids, you know very well what happens when you go out for a familiar dinner: everything gets crazy. Kids tend stand up all the time, run everywhere and go to play right away after they eat. 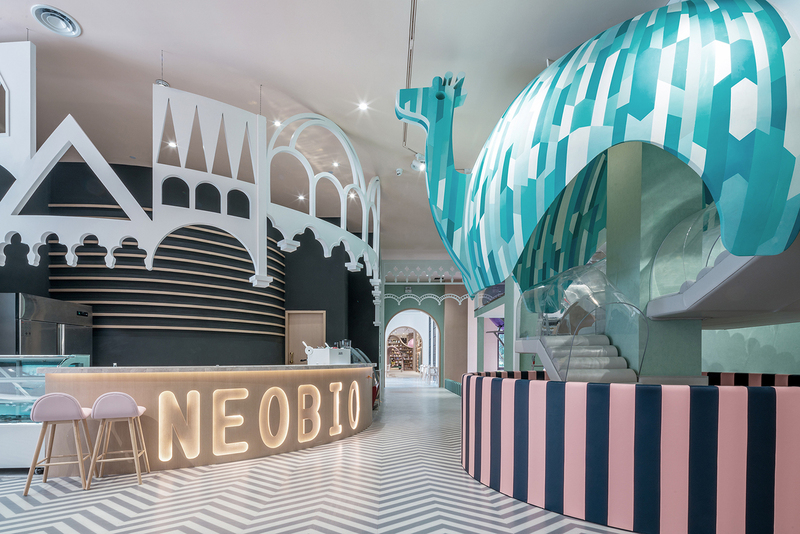 That’s why today we pay tribute to this magical place for children: Neobio Kids restaurant. The interior design, by X+Living, divided the space into 5 different areas: Reading Area, Dinning Area, Sims City, Climbing Area and Party Room. Entering the main entrance, we are surrounded by wavy forests and rolling hills, which are book shelves of the reading area and are the best place for kids to play hide-and-seek. Every tree hole is an exclusive small world for the children. Through the ocean pool-like stairs we come to the Sims City, where a miniature city is created. Here you could find urban road system, including roads, zebra crossings, street lamps and parking lots. In the middle, a 3-stories house is divided into left and right side, within which there are mini post office, gas station, supermarket, hospital etc. ; also there are kids’ favorite Play House scenes: kitchen, dress, make up and changing diapers for babies. 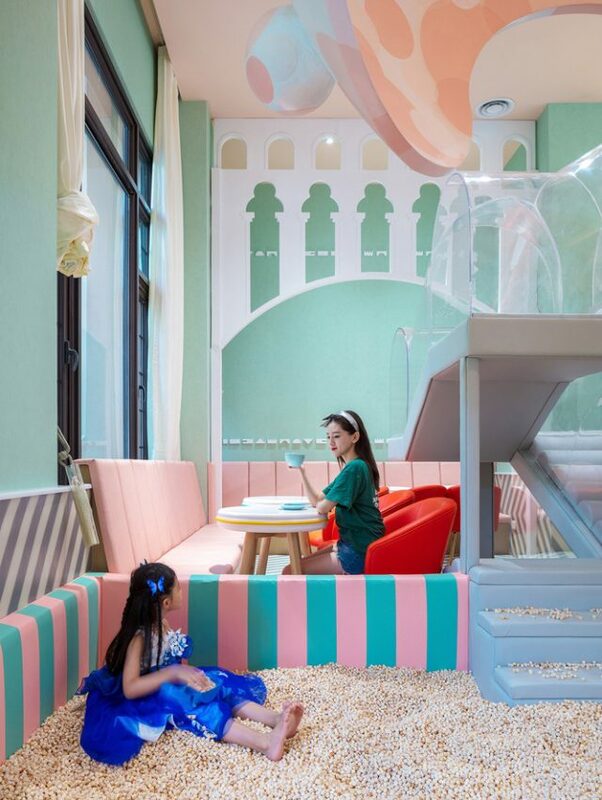 The kids could go every corner freely in the mini city, and parents could watch their kids having fun at the rest area on the opposite side. Go across along Time Tunnel, we arrive at the Big Child Area where parents could bring their children to enjoy delicious food in the dining area after the children had a great time playing all around. 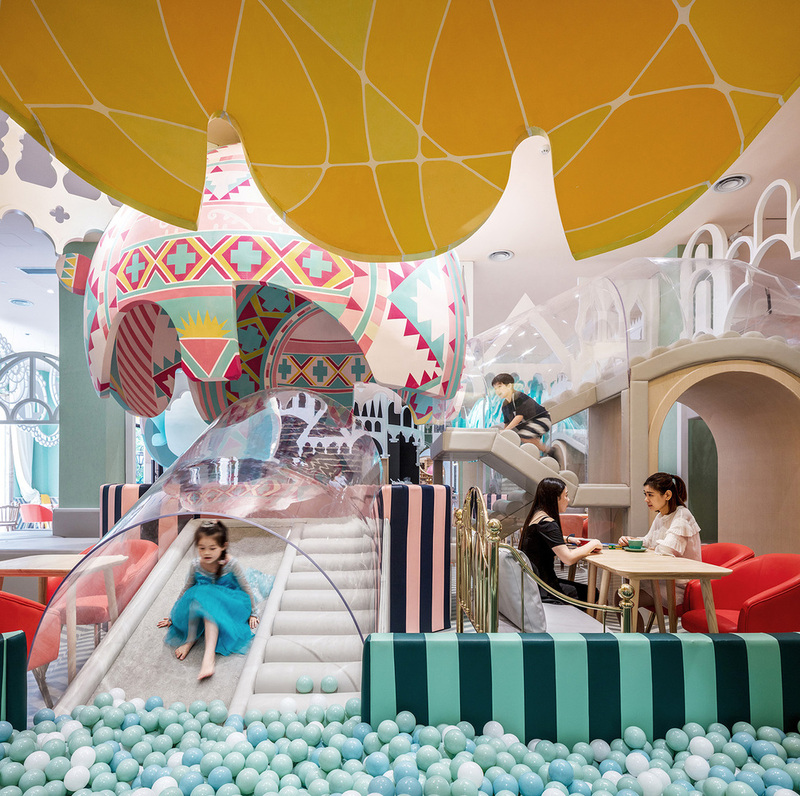 In the dining area, lots of balloon-like hanging Game Boxes are designed, all of which are connected by transparent crawl ways, children could have fun crawling all around. There are dining tables around these boxes, allowing parents to take care of their kids while dining. Two VIP rooms are designed for families who require private space. 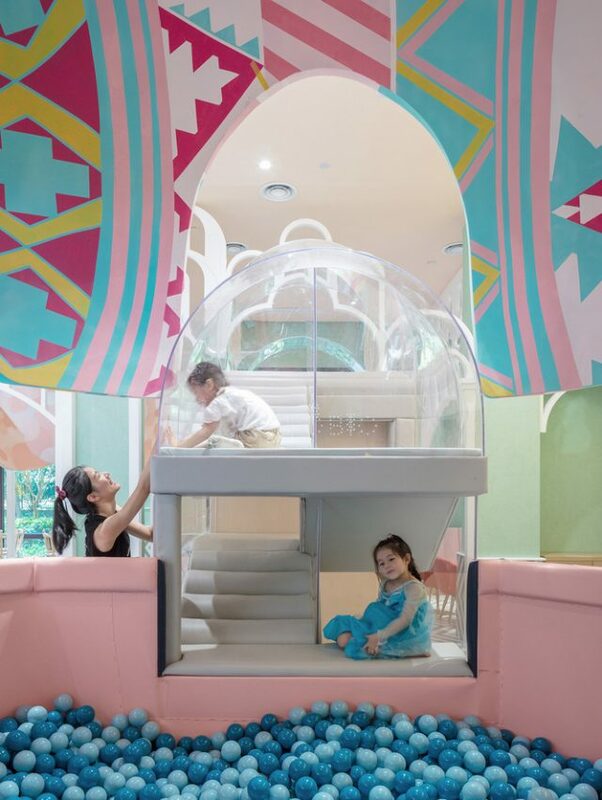 In the basement, there is the Party Room for kids with various themes such as Indian, desert and Mediterranean. 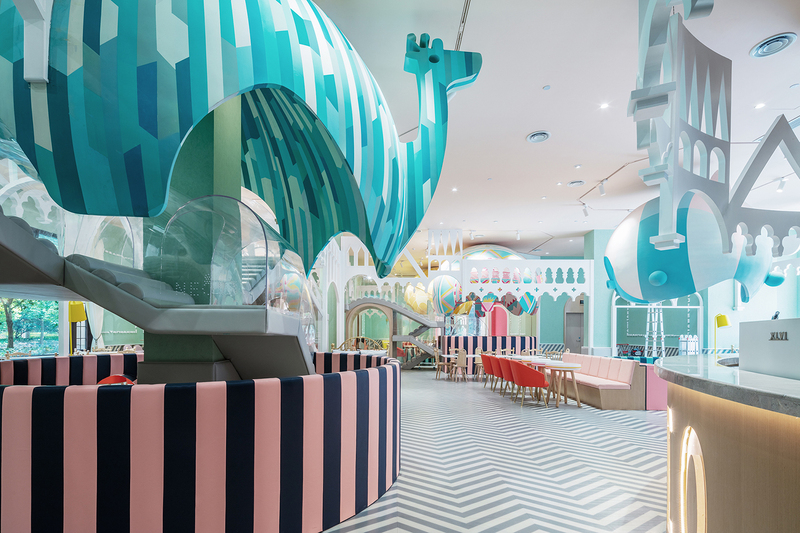 Here, children could hold birthday party in their favourite room. 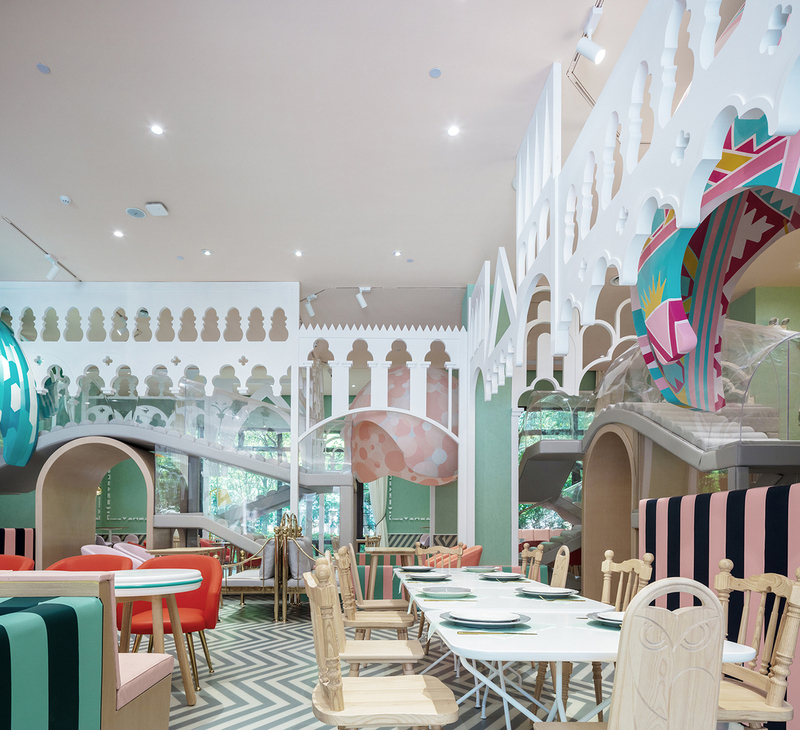 Definitely that restaurant is a paradise for active kids and parents that just want to enjoy a dinner (at least once).